Immigration is one of the most divisive and polarizing topics today. Do immigrants take American jobs, or help our economy grow? Do immigrants drain our welfare funds, or can they help refill public coffers as our baby boomers retire? One argument you tend to hear in the immigration debate in the U.S. is that there is a fixed number of jobs in the economy — and immigrants just compete for a slice of the pie rather than helping the pie grow. This perspective is less prevalent when talking about startups, however, because the rate of entrepreneurship has declined significantly in the U.S. over the last 30 years, and fewer startups are being generated today. With many places looking to stoke economic growth, state and local governments have clamored to launch initiatives to attract more immigrant entrepreneurs, hoping they will found businesses and create more jobs. Globally, many countries are doing the same — for example, Chile pays overseas entrepreneurs to come visit for six months through its Start-Up Chile program, as a way to build global bridges and foster an entrepreneurial culture at home. But to harness immigrant entrepreneurship for better growth and job creation, we need more hard facts. Good statistics on immigrant entrepreneurship are exceptionally difficult to assemble, and therefore it’s challenging to create productive policies. Likewise, most standard government sources that are publicly accessible can only tell us about immigrant self-employment, which leaves a big question mark around job creation and economic growth. Our recent research aims to address this. 1. Immigrants constitute 15% of the general U.S. workforce, but they account for around a quarter of U.S. entrepreneurs (which we define as the top three initial earners in a new business). This is comparable to what we see in innovation and patent filings, where immigrants also account for about a quarter of U.S. inventors. 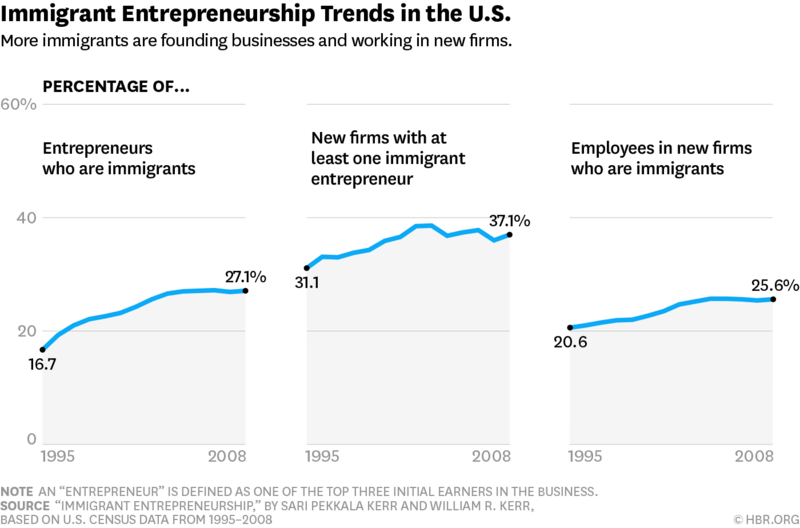 The figure below shows that this immigrant share of entrepreneurship has been increasing dramatically since the mid-1990s, when the immigrant share of founders was closer to 17%. This rise in immigrant contributions to entrepreneurship is sharper than the rise in the immigrant share of all employees in new firms. You can also see that, in total, 35%-40% of new firms have at least one immigrant entrepreneur connected to the firm’s creation. We are still in the process of uncovering why. We have identified that the choices made by immigrants with respect to industry and geographic location are an important part of the story—that is, immigrants choose settings with heightened “up or out” dynamics. But we don’t yet know whether this is due to greater risk tolerance by immigrants, better skills and ethnic social networks for navigating these settings, pure coincidence (i.e., immigrant happen to be arriving in cities that are very dynamic), or something else. If we use statistical methods to control for the location and industry of where a company is started, immigrant entrepreneurs are more likely to survive than their native peers, but they’re only modestly more likely to experience employment growth, and their payroll growth is slower than that of native-founded firms. Thus, much of the growth and volatility properties of immigrant firms result from where they decide to found their companies. Among VC-backed start-ups, immigrant and native entrepreneurs do not show meaningful differences in terms of our growth metrics. 5. We are just starting to be able to separate types of immigrant — e.g., those coming to the U.S. as children versus adults, those initially working in large companies versus in universities versus in startups. This will vastly improve policy making, which has so far suffered from having too little information to work with. For instance, let’s look at Sergey Brin, who is frequently used as an example to advocate for expansion of H-1B visas under the assumption that this would boost American high-tech entrepreneurship. There are several problems with the argument, one of which being that H-1B visas are mostly issued to skilled employees working in large firms, which means that any entrepreneurial stimulus would come with a time lag. Further, Brin came to the U.S. as a child, and is thus not representative of adult skilled migrants under H-1B. Now that we can study the age of arrival, we found that immigrants coming to the U.S. as children are more likely to start larger firms than immigrants arriving as adults. Moreover, firms created by immigrants who have grown up in the U.S. are generally associated with better outcomes, in terms of lower closure rates and higher representation among larger firms. Much remains to be done here, but we hope this serves a spring board to the study of other migrant traits. We are by no means near the finish line at understanding the causes and effects of increasing immigrant entrepreneurship. We don’t yet know, for example, what share of hiring created by immigrant-founded firms flows to natives or to other immigrants. But hopefully many more pieces can emerge in time for future debates about immigration.